My name is David. I am a wildlife removal specialist. I started my career in 2001, & am based in Florida. Over the years, I have met and spoken with hundreds of other wildlife operators throughout the United States. We have shared many ideas and refined our techniques over time. I have also personally trained several close friends and even family who I knew were capable of being great wildlife removal experts, and they have now started their own businesses in different cities. 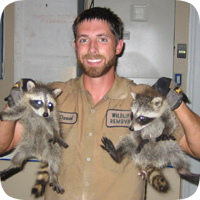 On this website, you will find hundreds of excellent, qualified wildlife removal professionals, serving over 500 different US cities and towns, covering 98% of the US population. Just click the map on my home page to find a pro in your area. It is my goal with this website to educate the public about responsible and humane methods of wildlife removal, and also effective methods. I have witnessed hundreds of very poorly done wildlife removal jobs attempted by shoddy operators, poison-minded pest control companies, and uninformed do-it-yourself homeowners. A job done wrong usually results in frustration for the homeowner, more damage caused by the animals, and suffering for the animals. I want to avoid this! This website provides the knowledge to attempt to do it yourself correctly, or in the event that you are unable, to hire the right person for the job. If you have a wildlife conflict, you have a responsibility to yourself and the animal to do it right. Wildlife removal is not easy. I have many years of training and experience, and it's still a challenge. There are so many risks, so many things to know. And there are many laws governing wildlife removal. In order to do what's best for you and the animals, in many cases I highly recommend hiring a good pro. • Specializes in wildlife removal only. Not insect pest control. Never uses poisons. • Is fully licensed (wildlife and business) and insured (liability insurance). • Is available to work seven days a week (wildlife don't take weekends off). • Offers full line of services, including damage repairs and attic cleanup. • Give a guarantee on all wildlife exclusion repairs so that critters don't come back. • Is able, willing, and LIKES entering attics and under houses to get the job done properly. • Is humane in treatment of wildlife - animals definitely have emotions and feelings. • Is polite and courteous to customers - good manners are important for everyone. Why hire someone that I recommend? I list about 250 companies in 600+ cities and towns here on my website (many companies cover multiple areas). Many of these companies are personal friends who I have trained myself. All of these guys are outstanding, far above the average level of service and professionalism you'll find in this field. Some of my friends have even trained their friends in turn, passing on the wildlife control principles that I've developed over the years. I have listed most of the companies that I recommend for many years now, in most cases more than five years. I almost never hear a complaint about anyone that I list, and if I do, I take it seriously and remove them from my listings if they get more than one complaint. I believe that I have compiled the best list of companies out there. You can do your own search for a company, and definitely don't hire someone unless you feel comfortable with them. But beware, there are good and bad companies out there, just like any profession, and regular online marketing and reviews can be misleading. If you hire from my list, you know you're getting a company that meets my guidelines. I can't guarantee their work personally, but again, if you ever have a comment, good or bad, let me know! This keeps my list top-notch.